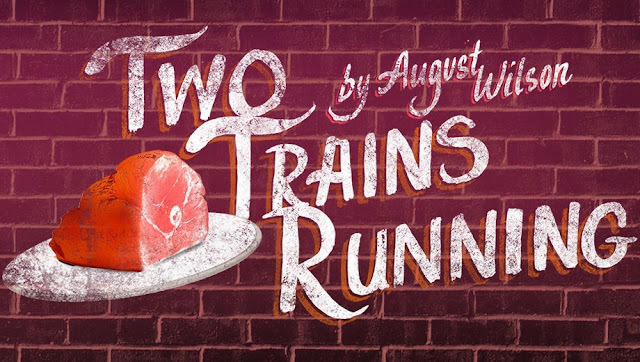 Though the Black Power Movement and their various rallies and protests are only mere background elements in the work, August Wilson’s Two Trains Running is a refreshing depiction of white exploitation, racial conflict, oppression, hopelessness and the humor and love that’s used to counteract all of that within an urban black community. The plausibility behind all Wilson's characters' hopes and desires lies in not only conviction in their dialogue, but also in each of the character’s ability to keep pushing for what they want, even if their logic is not always rational. Regardless of whether it is love, money, success, respect or ham that they want, everyone has something to strive for and it is something they’re consistent at doing. Our lead, Memphis, is fighting a system that he doesn’t quite know that’s there to get the money he deems is acceptable for his restaurant. The mentally-challenged, Hambone, has been striving for ham for questionable reasons from the local white butcher for the last nine-and-a-half years. He seemingly acts as a foil to Memphis as they both are actively demanding what’s due from white people in higher positions of power. Though Hambone’s need for ham acts as a bit of a comedic relief to the play, after his death, all of the activism done in the name of ham is illustrated to be not so different than Memphis’ in regard to the situation with his money and his restaurant. Similarly to Hambone’s persistence in getting his ham, Memphis’ overtly driven personality is also what pushes him forward in his struggle against the white city developers that want his restaurant. However, it’s also the added ambiguity in different elements of their many of their rationalizations in accordance to their desires that also ties them together. For example, we don’t know why Hambone strives for ham from the white butcher nor is it ever revealed even after his death. As for Memphis, he believes that people are free agents that can do as they please. However, he cannot comprehend just how institutionalized racism still inhibits and limits specifically black people from doing what they want to do. Even though he acknowledges that white people owe him certain things, it is solely due to his own sense of entitlement, rather than one from a political standpoint that sees the higher, white forces working against black people like him. A young, politically-curious, ex-convict named Sterling wants the love of Risa, one of Memphis’ workers, along with copious amounts of money. The same goes for his comrade, Wolf, who runs an illegal lottery service from Memphis’ restaurant. Wolf’s work brings him some uneasiness due to the unfairness in how the winnings are distributed rather than its illegitimacy or the fact that it contributes to the exploitation of the impoverished people of his town. Sterling just wants a job. Though men like Memphis might assume that men like Sterling can’t find work because they’re lazy, the play itself insinuates that it’s quite hard for black people to find work, which is true during the time in which the play is set. Though Sterling's unbalanced nature which lies in both his spiritual and political convictions on top of his criminal record also inhibit him from being able to hold down a stable job, the harsh reality of the matter is that white business weren't hiring black people. But, of course, he doesn’t realize this even though he chooses to advocate for the Black Power Movement while simultaneously listening to the likes of both Prophet Samuel and Aunt Ester, who preach conflicting spiritual convictions. Though all these things that these characters are striving for what seems like very straight-forward desires, it is the way that these characters view the world around them and societal institutions that are inscribed within that world, that inhibits them from fully stepping up to the plate to take ahold of their dreams. Though they seem to really know what they want and ultimately keep repeating it to themselves and others, it is hard to decipher whether they’re trying to prove something to themselves or someone else through these achievements. It's only through them realize just exactly what they're fighting against and for what reasons that they can realize this, but unfortunately for Wilson's characters, they have a long way to go.